Casa Corona is a large open-air site located in the municipality of Villena near the administrative border between the provinces of Alicante and Albacete. The site covers the top of a partially cut Late Pleistocene dune at the centre of a broad natural corridor known as the Villena-Caudete plain. The site was discovered by archaeologists of the Museum of Villena and excavated in 2008 by the company Arpa Patrimonio S.L., in a rescue programme resulting from the construction of the Madrid-Alicante AVE high-speed rail network. 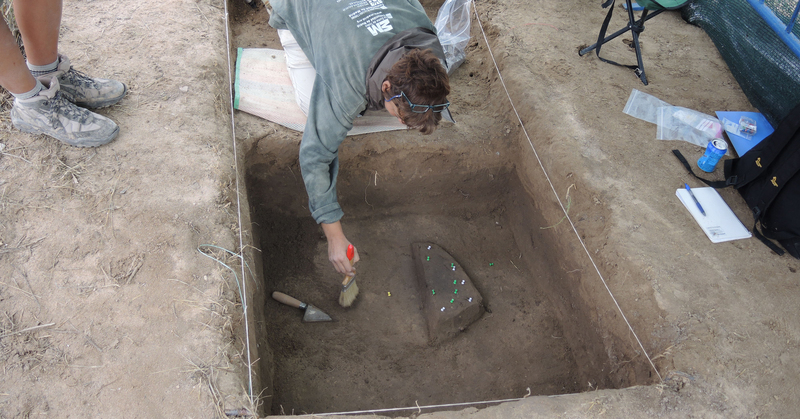 Since 2013, the site has been undergoing excavation by the IPHES in a multi-year inter-disciplinary fieldwork programme. Casa Corona contains evidence of occupation at different archaeological phases. The first occupation dates to the Younger Dryas, but most of the archaeological features (16 combustion structures) date from the Early to the Middle Holocene and the Early and Late Mesolithic periods. Two Late Mesolithic pit graves, containing two primary inhumations, were discovered during the 2008 excavations. The first is the burial of a woman aged 35-40 and the second is the primary interment of a child aged 12-18 months. Subsequent occupations date to the early post-Cardial Neolithic and the Chalcolithic periods (six pit structures).